This lovely (and easy!) 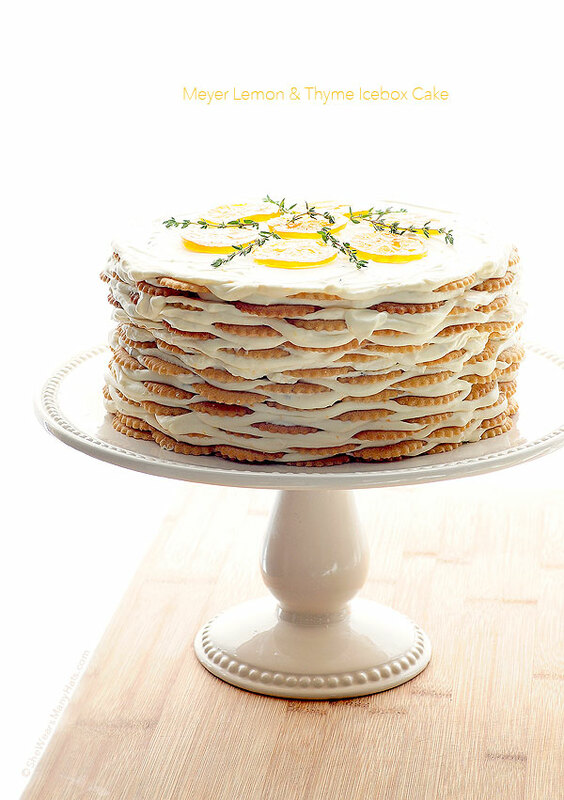 Meyer Lemon Thyme Icebox Cake is the perfect celebration cake with no baking required. 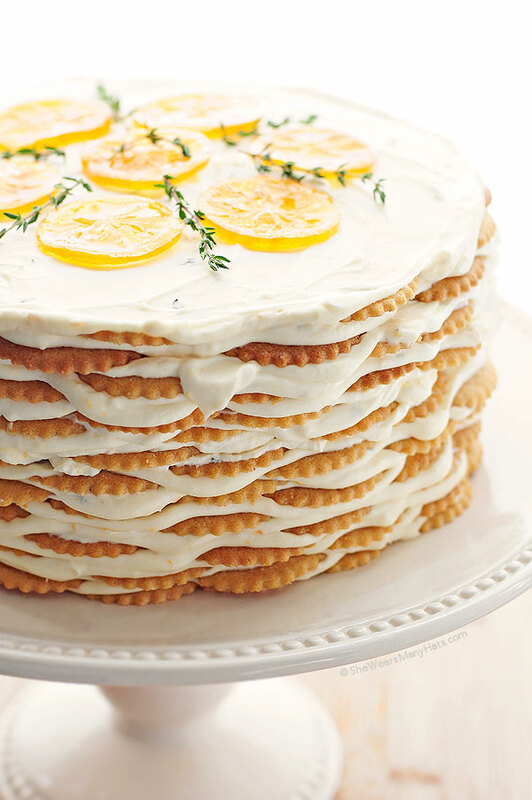 No need for an oven with this lovely Meyer Lemon Thyme Icebox Cake. This icebox cake is perfect for any spring or summertime occasion. From baby showers and Easter lunch, to Mother’s Day and backyard barbecues, this cake would be a lovely addition to the celebration! This recipe was my answer to a challenge from KitchenAid® a few years back. The challenge was to create a recipe for a springtime no-bake cake. Bright, fresh, springtime flavors came to mind, like lemons, and thyme. So I gathered my favorite cake plate, a bunch of Meyer lemons, some pre-made vanilla cookies, plus a few other basic ingredients, and began to form a plan. I wanted the cake to be simple to make, but still a showstopper—an impressive cake filled with loveliness and flavor, reminiscent of spring or summertime, when the living is easy and sweetness abounds. But the best part? No baking required. So easy! 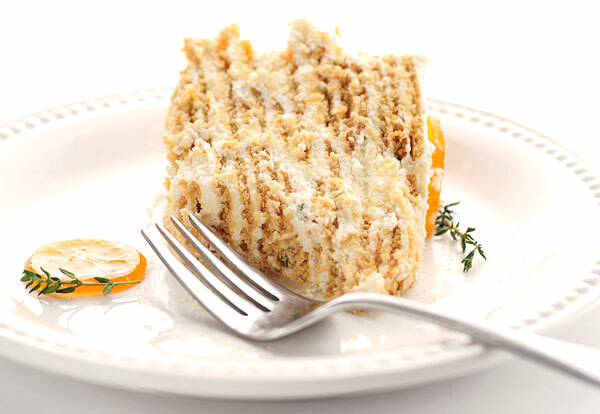 Before making this easy cake, be sure to create space for it in the refrigerator. This cake requires at least 3 hours of refrigeration to set and must be refrigerated until ready to serve. Some basic mixing and simple assembly is the extent of technique required for this no bake cake. Begin by whipping up heavy cream with fresh thyme and Meyer lemon zest. Separately whip together cream cheese, honey and lemon juice until combined. Fold the whipped cream mixture into the cream cheese mixture to create a smooth and fluffy filling. So aromatic too! 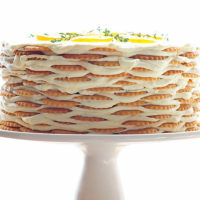 The cake assembly begins with a layer of cookies on a cake plate, followed by a layer of the whipped cream cheese filling. Add another layer of cookies, and so on until the desired height is reached. Top it all off with a lovely garnish of Candied Lemon Slices, and more fresh thyme. Such a pretty cake! I have to admit it was quite fun building this cake—like legos for adults, only edible. And super duper easy too! The flavor of the no bake cake is astounding, but not overwhelming. 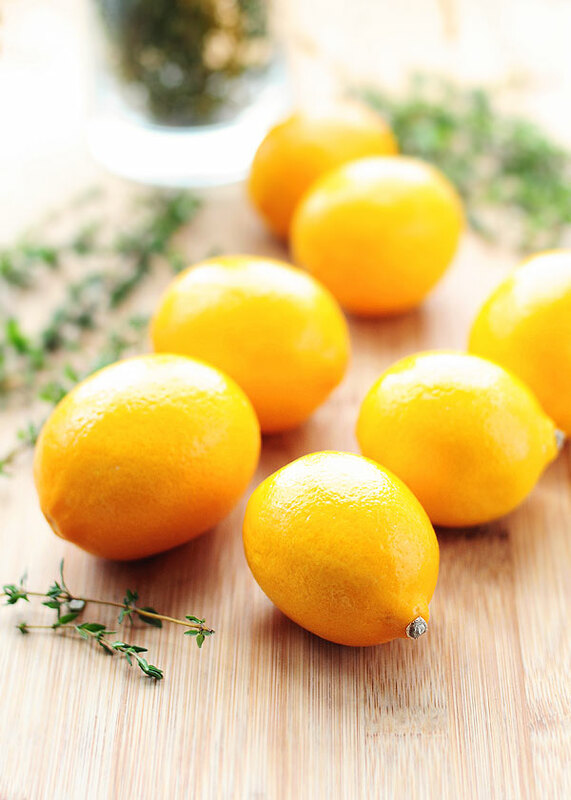 Meyer lemons, thyme and honey are such a heavenly combination. It is pure lightness and happiness on a fork! For easy prep ahead, whip the cream cheese filling a couple of days ahead, then cover and refrigerated until ready to assemble cake. While any thin vanilla or lemon cookies may be substituted, I used a favorite Moravian lemon cookie found at a local grocer. A thinner cookie will work better as it is easier for layering evenly, and absorbs moisture to soften nicely for slicing and serving. Vanilla wafers, and those inexpensive butter cookies would work well too. You know the ones we enjoyed as kids that are shaped liked flowers with holes in the center that we wore as rings? Just be sure to adjust amounts accordingly. The recipe below is based on the very thin 2-inch Moravian cookie size. Powdered confectioners sugar may be substituted for honey. Use an additional 1-2 tablespoons of cream to create a smooth consistency. Edible Candied Lemon Slices are a wonderful garnish for this cake. Easily prepare them ahead and refrigerate until needed for garnish. If fresh thyme isn’t handy, substitute dried. If using dried, use 1/3 of the amount. 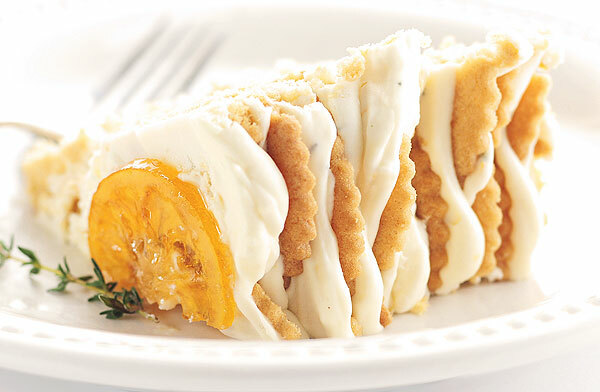 This easy icebox cake is a wonderful flavor combination perfect for spring and summer. Add heavy cream, chopped thyme and lemon zest to a large mixing bowl and whip until soft peaks form. Set aside. Whip together cream cheese, lemon juice, and honey until smooth and light. Fold in whipped cream until combined and smooth, cover and refrigerate* until ready to assemble cake. Assemble cake by arranging 12 2-inch cookies in a circle on 10-inch cake plate (a ring of 9 cookies, edges touching, with 3 in the center). 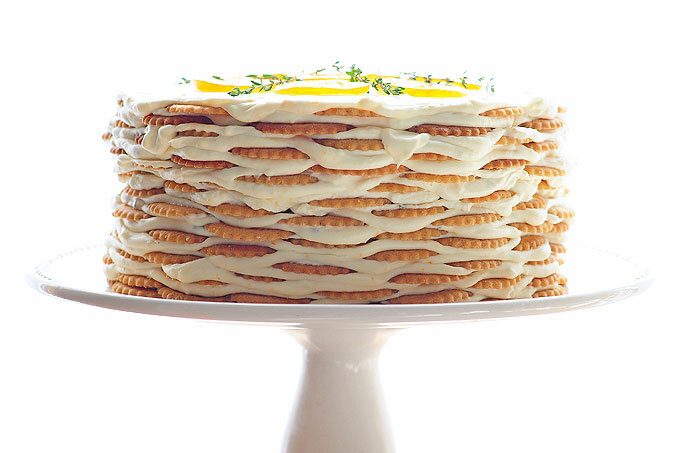 Gently spread 1/2 cup of cream cheese whipped filling over layer. Repeat cookie and filling layers until desired height. Top with final layer of cream. Refrigerate for at least 3 hours, or until ready to serve. When ready to serve, garnish with candied lemons, and fresh thyme if desired. *Cream cheese whipped filling can be prepared up to 2 days ahead and kept covered refrigerated until ready to assemble cake. 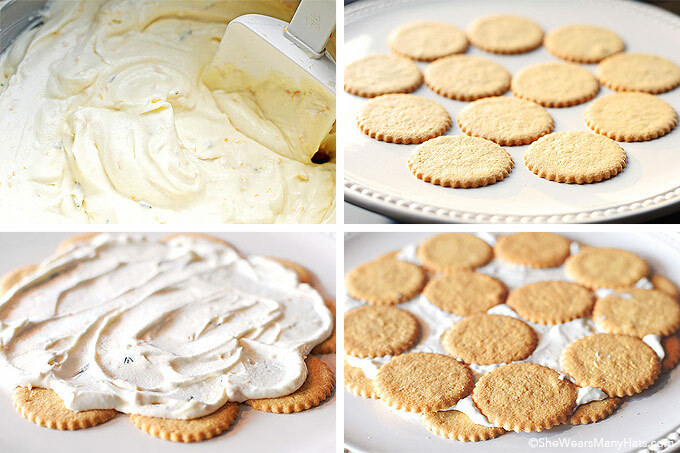 Substitute vanilla wafers, sugar or butter cookies for the thin cookies. Powdered confectioners sugar may be substituted for honey. An additional 1-2 tablespoons of cream may be needed to create a smooth consistency. This post was sponsored by KitchenAid, March 2014.